“Regular Guy” Al Capone’s Cocktail Shaker for Sale. Get It! Infamous gangster Al Capone’s cocktail shaker and a claret jug from the Titanic are among the treasures at an extraordinary auction taking place in London next week. The collection belonged to Stanley Seeger (pictured), an art collector and musician, who died in 2011 aged 81. Although born in the US, Seeger lived for most of his life in the UK and quietly amassed an extraordinary collection of art and artefacts spanning 50 countries and several million years of condensed history. Drinks curiosities in the sale include the aforementioned cocktail shaker belonging to Capone. 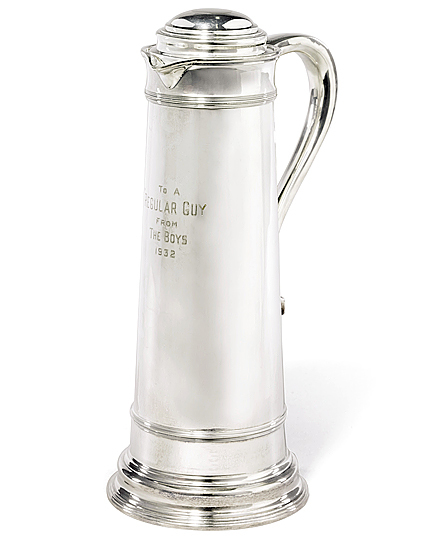 Priced at £1,000 – £1,500, the silver shaker is engraved “To A / ’REGULAR GUY’ / From / THE BOYS / 1932“. Also of interest is a claret jug (£2,000-£3,000), which was used on the sea trials of the RMS Titanic before its maiden and ultimately doomed voyage.